When I was first diagnosed with celiac, in 2005, it was hard to find folks who were also living gluten-free. None of my friends had ever heard of this. (One of them suggested it was all a made-up woo-woo thing and suggested I just eat a doughnut. We’re not friends anymore.) There were no gluten-free restaurants, gluten-free apps, or gluten-free conferences. There were simply a handful of blogs, the Gluten Intolerance Group (very helpful), and some forums. Oh, the forums. I was so discouraged reading them, since everything seemed to be gloom and doom, advice to only go to chain restaurants with gluten-free menus, and recipes that never inspired. That’s part of why I started this site. I wanted to read the uplifting, funny writing and advice I couldn’t find online. Oh, how things have changed! Nearly everyone has heard of gluten-free now. There are thousands of gluten-free blogs. Great restaurants serve us safely. And there is The Gluten-Free Marketing Group, our latest sponsor. Spearheaded by the energetic and talented Jen Cafferty, The Gluten-Free Marketing Group has found plenty of ways to help those of who are gluten-free. They have Find Me Gluten-Free, a great app for finding gluten-free restaurants wherever you may be. It’s fueled by the recommendations of gluten-free people who have eaten safely in those places, so I trust those suggestions more than anything on Yelp or Google. We’ll be using the app all through our potluck roadtrip in California (next month! details coming soon) to find places to eat. The Gluten-Free Marketing Group also runs the Gluten-Free and Allergen-Free Expos, great conferences with expert speakers and hundreds of vendors with gluten-free food. I’ll be speaking at the Chicago Expo in April and I’m looking forward to meeting many of you there. We’ll be working closely with The Gluten-Free Marketing Group this year to help promote the work they do and help wherever we can. We believe in what they do. Now, I’ll let Jen tell you more about that work herself. What inspired you to begin the Gluten Free Marketing Group? I saw a major need within our gluten free community to connect consumers and companies. The Gluten Free Marketing Group was created to help our clients – over 2 million consumers and 500 manufacturers – easily get to know each other. It all started in 2008 when I held an Expo in Chicago to help people learn how to cook gluten-free food at home. What started as a cooking demonstration with a few vendors as sponsors has now become the largest gluten and allergen-free event tour in the U.S. with hundreds of vendors exhibiting in seven cities. We recently started The Gluten-Free Marketing Group as a way to provide consumers and manufacturers even more ways to connect. The The Gluten-Free Marketing Group is two-pronged. We offer services for consumers (Expos, Restaurant Finder, Recipes, etc…) and ways for manufacturers to reach the consumers. Besides our Expos, we added Find Me Gluten Free this past year and are excited about adding more services for the consumers to help them live an easier gluten free life. In 2014, we are expanding to add an “Expo in a Box,” a monthly subscription box that will allow consumers who can’t get to the Expos to try products at home. We are also launching a free quarterly e-magazine for consumers. For the manufacturers, we will be offering consulting services to help with their marketing needs. Everything we do helps both the consumers and companies and is a win-win for everyone. What does The Gluten-Free Marketing Group do? The The Gluten-Free Marketing Group introduces the gluten free consumer to companies or services such as restaurants, dietitians, chiropractors and more. Our team not only helps guide the community on how to live a better gluten free life, but also helps to educate and grow gluten-free businesses. It’s the best of both worlds rolled into one company. The The Gluten-Free Marketing Group is the hub for all things gluten free. Why Do You Promote Gluten Free Food? Everyone needs to eat – whether it’s by cooking at home, dining out, or buying gluten free products. My family is gluten free (along with additional food allergies), so I know firsthand how hard it can be for people to follow a “free from” diet. Living free from doesn’t have to be so difficult if you know which products taste great, where to dine out safely, and how to prepare meals at home. I want to make sure that everyone has food that nourishes them, comforts them, and keeps them happy and healthy regardless of their food restrictions. Can you tell us about your app? Find Me Gluten Free is such a great resource for the community. Yahoo recently rated us as a “Top 10 Restaurant Finder” and we just surpassed Open Table in the number of restaurants and monthly new additions. Find Me Gluten Free is driven by our amazing gluten-free community; they share their experiences as well as rate and review restaurants. Find Me Gluten Free helps users find over 30,000 gluten-free-friendly businesses nationwide. Whether they’re traveling, socializing, or just need a quick bite to eat, people living a gluten-free lifestyle should be able to eat safely and comfortably. Our “LOCAL” button allows our users to see the gluten free restaurants in their area. If someone finds a hidden gluten-free gem, they can recommend the restaurant for our database and then our staff researches and confirms that it is indeed safe to add to our list. Find Me Gluten Free will expand even further in 2014 to become a comprehensive resource for all things gluten free. Our users will be able to find restaurants, recipes, articles, products and more on our app and website. 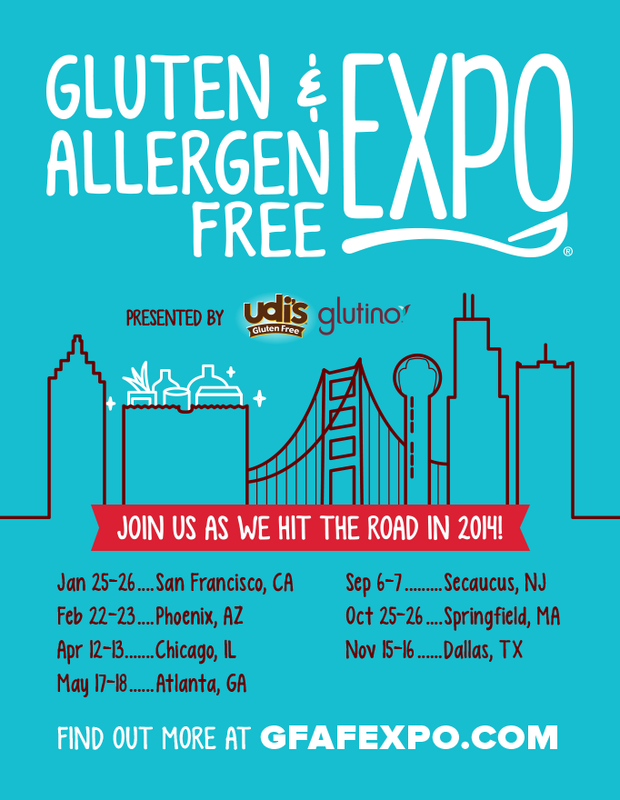 Where and when is your next Gluten-Free Expo? We have seven Expos across the US in 2014. The Expos’ offerings meet the needs of the celiac community, those with gluten sensitivities, autoimmune disorders, inflammatory diseases and autism. Athletes and the health conscious benefit greatly as well. We’re excited to return to San Francisco on January 25-26 at the San Mateo Event Center. The Expo features over 120 vendors sampling and selling gluten free products. All of our vendors are gluten free and many will also showcase products free of the top eight allergens: milk, egg, peanut, tree nut, fish, shellfish, soy and wheat. It’s the perfect way for consumers to try products before they buy them. We urge them to come hungry, as there will be plenty of free samples. A variety of free classes will be offered on both days of the Expo. We recommend purchasing tickets ahead of time via our website, as limited tickets are available each day. Visit our website for more details. Thank you, Jen. We’re glad to be able to tell our readers about what you do. This is really inspiring, especially now that I am developing products free from the 8 most common allergens for the market in Norway. Will do what I can to get to one of your expos. What a fantastic event! I think gluten-free eating is healthy even for those without celiac. My husband and I just finished reading “Wheat Belly” and “Grain Brain” so we have decided to eat gluten free and Our children too. We are only on day two of eating gluten free and it is a bit overwhelming but I am excited about it. Thank you for this website I will visit regularly. I think this expo is great and I hope to attend. I love this blog! Just a quick note that Springfield MA is in Western Massachusetts, a few hours from Boston and Hartford. This sounds like a great event – thank you for drawing attention to it!